Otavio Schipper is an artist with a degree in physics who, through the presentation of ready-made objects such as antique telegraph machines, tuning forks, eyeglasses, elevator cabins and electric poles, connects past physical worlds with our present mental landscapes. Sergio Krakowski is a New York City-based musician and composer who has a prominent career both as a jazz instrumentalist and a contemporary sound artist. 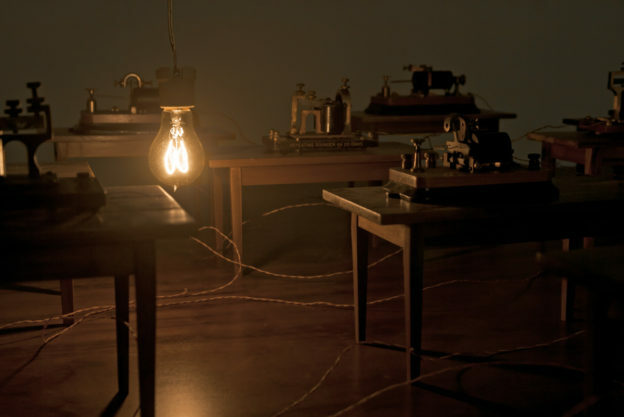 As a sound artist, Sergio collaborates with Otavio Schipper since 2008, with whom he created the sound installation ‘Mechanical Unconscious’, a robotic piece for telegraphs, synthetic voices, telephonic sounds and a light bulb. Question: Which SynBio ideas do you find especially intriguing, and which have influenced your art to this date? Otavio Schipper & Sergio Krakowski : Many scientists support the theory that life first arose as RNA-based instead of DNA-based. This theory is a highly plausible pathway to life because RNA, like DNA, can store genetic information and catalyze many of the chemical reactions required to maintain cellular life. Though well supported, the theory still lacks some important pieces of evidence, and scientists are trying to prove what the actual process was that caused the giant leap from the proverbial “primordial soup” to the formation of RNA. Decades ago, chemist James Ferris created long chains of RNA molecules in the lab using simple clay materials and basic organic molecules as a catalyst. In his theory, a simply clay material likely to be found on the surface of Earth around the time of life’s formation served as a catalyst for the formation of RNA. I am particularly interested on the relationship between materials (chemical elements) and the generation of information devices (memory), such as RNA molecules, which is a fundamental for element the creation of the first living cells. 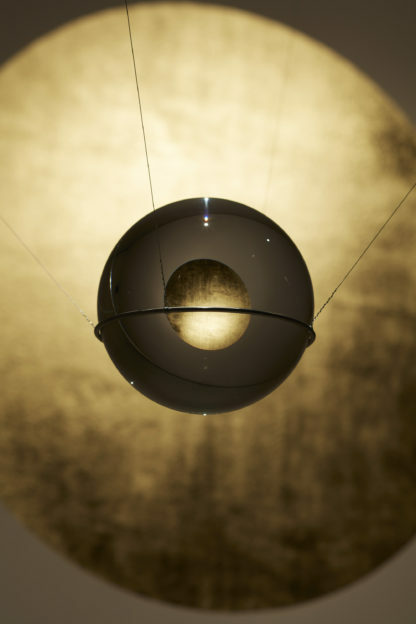 OS & SK: Created in collaboration with musician Sergio Krakowski, the sound and light installation “Smoking Mirror” was originally developed for the Schering Stiftung Project Space in Berlin and explores a space left open by scientific research into altered states of consciousness. It has been known for some time that specific frequencies, derived from measuring electrical potentials across the whole brain, are linked to varying states of consciousness, such as attentive and dreamy states. Although occurring naturally, such states can be induced through external techniques like meditation or hypnosis. 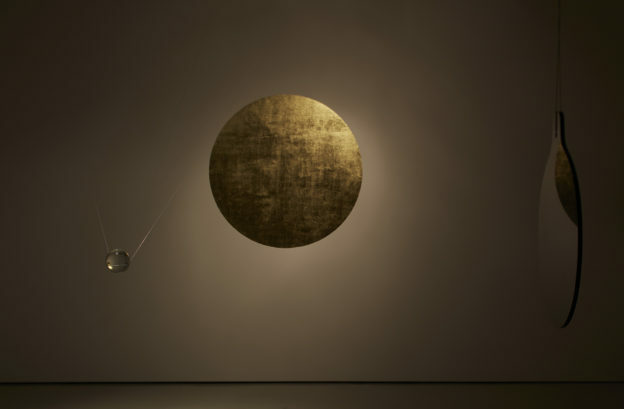 We make our contribution into induced heightened states by mixing synchronous light and sound stimuli with reflective objects, inspired by the English mathematician, astronomer, astrologer and mystic John Dee (1527–1608) and his collection of magic objects and optical devices. Smoking Mirror is our interpretation of altering consciousness through stimuli designed to push us into our own unexplored space. Question: Can you talk about your inspiration for Bacterial Opera? OS & SK: The original project we have submitted to KLAS Residency Program involves the study of how sound can influence the behavior of bacteria. Our main initial idea was to establish a certain kind of communication between human beings and bacteria that would happen through sound. 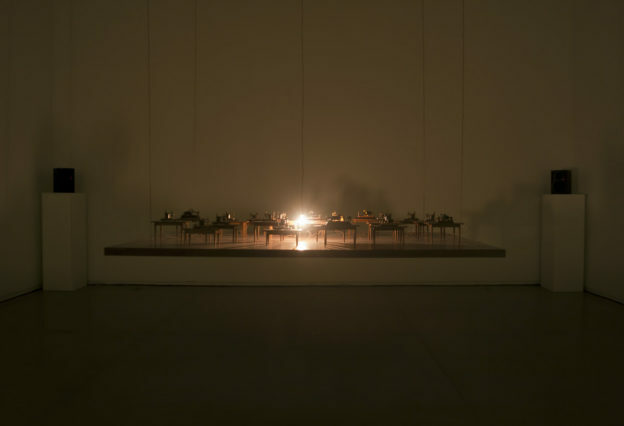 One of the possible artistic scenarios for this work would involve playing music to a colony of bacteria and measuring its voltage modulations when submitted to sound, aiming to use this raw signals from the colony in order produce Music (for example translating those signals into specially constructed sound devices) in real time. Although we intend to deal with such interaction, we strongly believe that focusing on the DNA content of both humans and bacteria can be another central source of inspiration for our work. In fact, our artistic practice has always been permeated by questions regarding the nature of information. 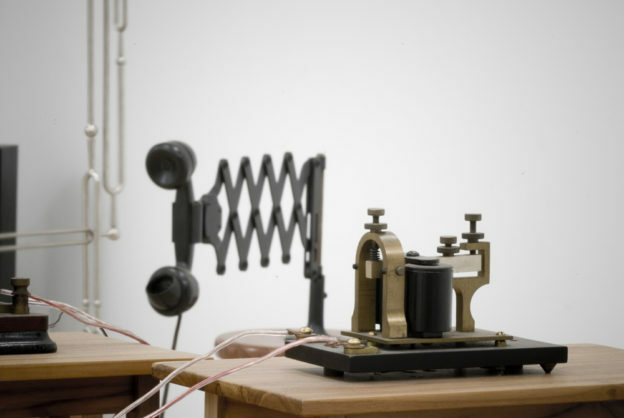 The installation Mechanical Unconscious, our first collaborative work, deliberately proposes a fictional communication between telegraph machines, and telephones sounds, creating a system of transmission and translation of information. The fact that the existence of humans and bacteria are both based on a common denominator (the DNA code of each being) is a great source of inspiration for us. This fact raises several poetic layers of interpretation that strongly relate to our previous artistic works, which are founded in the concepts of information, language and coding. One possible approach to this subject would be translating genetic information into sound and using this element in a Musical composition. Our final work could also involve the presence of lyrical singers that would interact with the colony of bacteria and the above mentioned constructed musical devices, creating therefore an Opera for bacteria and digital sounds. In this case, the Libretto should be composed within the context of the specific biological research. Question: What are your impressions about the first days at the MPIKG? OS & SK: The Max Planck institutes for Colloids and Interface has a unique atmosphere for the exchange of knowledge and collaboration between researchers and students. I have been very well received by the scientists and students, and am extremely grateful for having the chance to follow their cutting edge research and experiments at the labs. OS & SK: I believe artists can certainly contribute for the advancement of science, a field that requires both imagination and creativity as elementary tools for its own development. 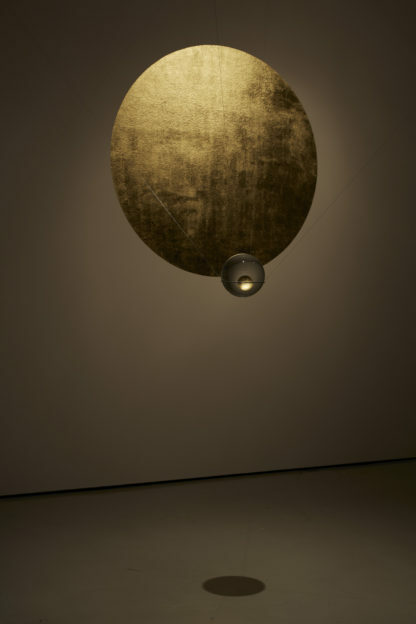 Collaborations between artists and scientists are recurrent in the last decades, and we can mention for example artists such as James Turrell and Robert Irwin, working with perceptual psychologist Edward Wortz, who conducted a series of experiments as part of the Art and Technology Program of the Los Angeles County Museum of Art in 1968 and 1969. Some of the research Turrell did in those years involved the Ganzfeld effect, a phenomenon whose name is derived from the German for “complete field,” and was first described by the psychologist Wolfgang Metzger (1899–1979), who noted that staring at an undifferentiated field of color causes changes in perception and even hallucinations. We should also mention the interest of the Surrealist movement concerning the latest scientific discoveries at the beginning of the twentieth century, such as the Relativity theory and the concept of the fourth dimension, which have strongly influenced the works of writer Raymond Roussel and artist Marcel Duchamp. Perhaps artists can help connecting people to scientific knowledge by proposing new subjective experiences and new ways to deal with concepts and materials, stimulating our sensibility and imagination towards the unknown. Question: Our call was addressed to all artists but we specified that in first place we would take into consideration those projects that involved contemporary procedures (new media, sonic art, new materials) and contemporary theoretical frameworks (New Materialisms, Object Oriented Ontology, Dark Ecology…). Can you highlight any shared areas of knowledge or parallelisms between the praxis of contemporary scientist, artists and thinkers? OS & SK: Harvard scientists have very recently pioneered storage of video inside DNA in a living cell, opening the possibility of using living cells to store information. They have developed this new technique trying to create a molecular recorder that can sit inside living cells and collect data over time, but it will certainly influence the work of contemporary artists that have been following new scientific discoveries. As philosopher Rosi Braidotti states, “Technological advances, notably the convergence of information and biogenetic technologies, the growth of ‘smart’ materials and their complex social and political consequences, are forcing a reconsideration of what counts as ‘matter’. The opposition between meaning and matter, culture and nature, is redefined in dynamic and symbiotic ways, both within academia and in society at large”. Question: The whole OOO / Speculative realism / Continental materialism / Dark Ecology complex has been gradually permeating both the artistic scene (Sonic Acts or Intermediale devoted their last exhibitions to explore this issues) and also the new philosophical approaches. Sociologist and anthropologist of science Bruno Latour has also been very interested in this new way of directing our quest for knowledge. What do you think about this renewed interest in materialism and object-based philosophical enquire? Do you find it interesting or useful? Why? “Cultural memory is a kind of institution. It is exteriorized, objectified, and stored away in symbolic forms that, unlike the sounds of words or the sight of gestures, are stable and situation-transcendent: They may be transferred from one situation to another and transmitted from one generation to another. External objects as carriers of memory play a role already on the level of personal memory. Our memory, which we possess as beings equipped with a human mind, exists only in constant interaction not only with other human memories but also with things, outward symbols. Question: What about sound? During the last 10 or 15 years there’s been a huge interest around sonic art, both in terms of artistic practice, presence in institutions and theoretical work being done all around the world. 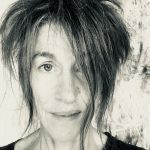 Scholars like Alexandra Supper or Karin Bijsterveld have also pointed out the possibilities offered by sound monitoring and sonic representations in the field of scientific research. They use the term sonification. Do you have any ideas in relation to sound and why it can (or cannot) be interesting in a project such as KLAS? OS & SK: Sound has become a very interesting tool for contemporary artists, opening a new field for artistic practice, more democratic and less constrained to materials and its physical properties. Sound can also become a very powerful medium to deal with the perception of space and time, and also a very interesting psychological element to be explored. In recent works we have been using sound and scientific research (such as artificial intelligence and computational music theory) in order to develop psychologically charged spaces, trying to lead the public into territories more closely associated with dream states and imagination dives, instead of a systematic organization of knowledge in the form of testable explanations and predictions about the universe. I find sonic representations in the field of scientific research a very interesting topic, as most of the scientific discoveries are based on optical visualization – through the use of lenses, optical microscopes, photographs, and computer generated images. One possible approach around this subject, related to our project for the KLAS residency program, involves the translation of genetic information into sound. Although our primary objective is artistic and not necessarily scientific, we do believe further work in the sense of translating genetic information into other sensitive mediums could open new paths for the understanding of this information. It is very much of our interest to be able to further develop these kinds of tools in partnership with some of the scientists from different research groups and laboratories. Otavio Schipper (Brazil, 1979) holds a degree in Physics from Universidade Federal do Rio de Janeiro and has received the 2015 Fellowship from the Akademie der Künste Berlin. The artist has presented the installation Smoking Mirror at the Kunstmuseum Thun (Switzerland) in 2017 and at the Schering Stiftung Project Space in Berlin (Germany) in 2015. He has shown his work at the exhibition Demo:Polis at the Akademie der Künste Berlin (Germany) in 2016 and at the exhibition Dessiner l’Invisible, organized by Fondation Mindscape, in Paris (France) in 2015. In 2014, Schipper has presented the installations Mechanical Unconscious at MOT International in London (UK), Pocket Landscape at Galeria Millan in São Paulo (Brazil), and Elevator Music at Project Space die Raum in Berlin (Germany). He participated in the exhibition The Wizard’s Chamber at the Kunsthalle Winterthur (Switzerland) and presented the installation The Trial, developed during his time in residence at Residency Unlimited, New York (USA) in 2013. 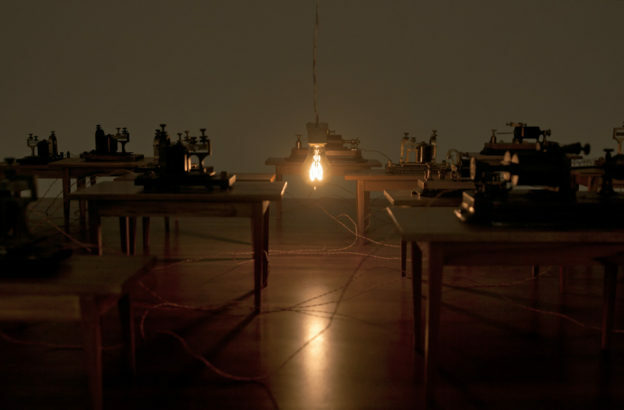 Through the presentation of ready-made objects such as antique telegraph machines, tuning forks, eyeglasses, elevator cabins and electric poles, his work connects past physical worlds with our present mental landscapes. The realms of imagination become present in the installations, which deal with the perception of time and the cultural memory of objects, leading to the questioning of boundaries between fiction and reality. The spectator often experiences a spectrum of sensations, from enlightenment to nostalgia. Elements of hard science and technologies from different periods lead the viewer into territories more closely associated with dream states and imagination dives. Sergio Krakowski is a New York City-based musician and composer who has a prominent career both as a jazz instrumentalist and a contemporary sound artist. During the PhD in Mathematics, Sergio was able to create new technology that allows rhythm to be used as code to control computer generated audio and video. Applying these tools to his own career as a percussion player, Sergio performed his one-man show in a myriad of stages such as The Guggenheim Museum of Bilbao and The Stone (NYC). The NY State Council of the Arts funded Sergio Krakowski to compose the piece Talking Drums, conceived for Jazz trio and Electronics. It was presented at the Museum of Moving Image, as part of the NY Electronic Music Festival (2015). 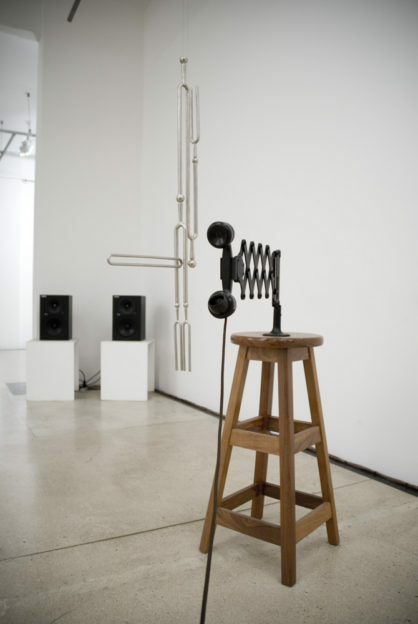 As a sound artist, Sergio collaborates with Otavio Schipper since 2008, with whom he created the sound installation Mechanical Unconscious, a robotic piece for telegraphs, synthetic voices, telephonic sounds and a light bulb. In 2012, Sergio was part of a Franco-Brazilian research team that built the Art and Mathematics international exhibition Regards dans les espaces de dimension 3. The work consisted in modeling, designing, and simulating sound propagation in various non-Euclidean three-dimensional spaces, engendering an immersive experience to the audience, and using rigorous mathematic models to create new forms of sound perception. It was presented in Paris, at Université Paris 13.